Controversial Nollywood actor, Uche Maduagwu has given a new prophecy and this time it is Tonto Dikeh’s ex, Churchill Olakunle. 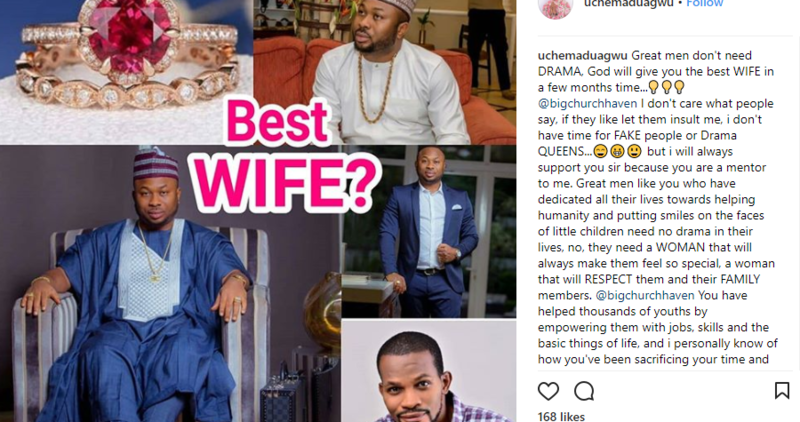 Uche Maduagwu wrote on his Instagram page that the wife Churchill will be blessed with will not be fake and a drama queen. Read his quote below. ‘‘Great men don’t need DRAMA, God will give you the best WIFE in a few months time…💡💡💡 @bigchurchhaven I don’t care what people say, if they like let them insult me, i don’t have time for FAKE people or Drama QUEENS…😄😀😃 but i will always support you sir because you are a mentor to me. Great men like you who have dedicated all their lives towards helping humanity and putting smiles on the faces of little children need no drama in their lives, no, they need a WOMAN that will always make them feel so special, a woman that will RESPECT them and their FAMILY members. @bigchurchhaven You have helped thousands of youths by empowering them with jobs, skills and the basic things of life, and i personally know of how you’ve been sacrificing your time and resources just so that you can assist little children whose parents are poor to getting worldclass EDUCATION.📚📚 All these you do not to attract attention, so why won’t God give you the best WIFE?”.